After a long break – I’m baaack!! Hello friends, I was feeling a bit overwhelmed trying to keep up with my posts, classes, life, etc., so I feel much better and ready to tackle this blog posting again. Tomorrow, I will bring you up-to-date on what I’ve created since you last visited me and what has been going on in my life. Hello my creative friends! I took Creative Chemistry 101 with Tim Holtz about four years ago and I’m getting a refresher this summer. Here are the tags I created for the challenges. Friends, you just have to take this class. 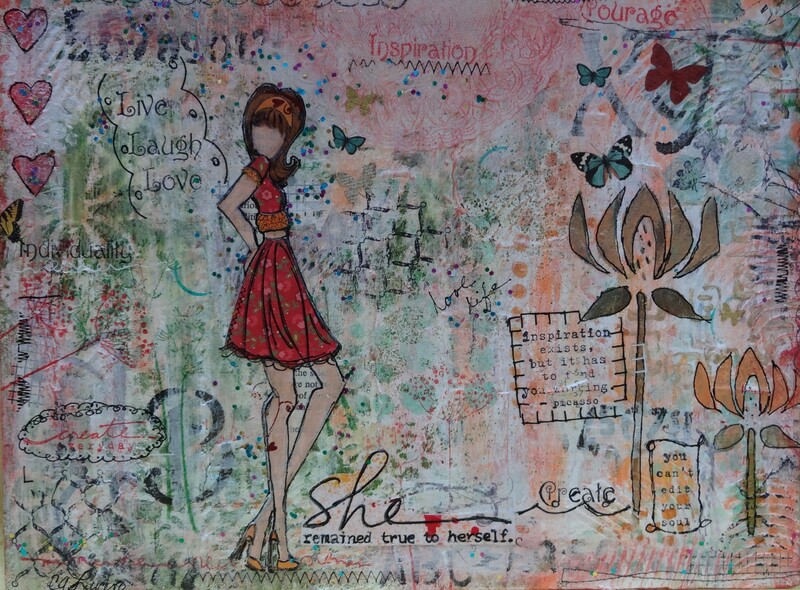 It covered so many things you need to know about Tim Holtz products – it was amazing! Day 1 – Tim is a wonderful teacher; he discussed the characteristics and properties of the products; dye vs. pigment inks, translucent vs. opaque, solvent, oil, or water based vehicles and porous vs non-porous materials. Day 2 – This day we learned techniques for blending, stamping, and layering with Distress Ink. Also, the wonderful way they react to water. It was fun going back and create these tags, but with some of the colors from the 2015 releases. I think I went a little crazy applying all the different colors and got the tag too wet; but it is wrinkle free!! Day 4 – We learned techniques for coloring backgrounds using re-inkers and how to store our ink creations. Day 5 – Tim showed us some wonderful techniques for creating background, stamping, and using stains for marbling effects. Day 6 – The techniques Tim shared with us for coloring and stamping with distress markers were awesome!! He also discussed the features of the markers and why they are different to other markers, but I didn’t have time to make the tags. After going over days 4, 5 & 6, our challenge was to make tags using the techniques we learned. 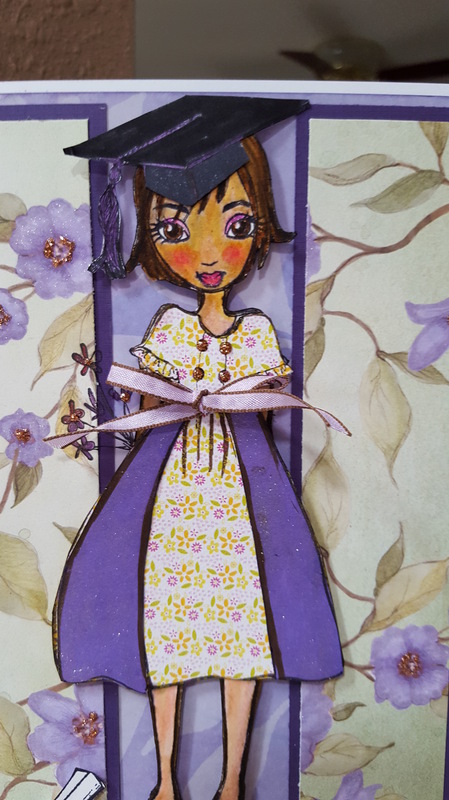 This week’s challenge was to make tags using Perfect Pearls and Distress Inks or Stains. Day 8 – We made some awesome distress crackle objects and paints and learned how they react. Day 9 – All about Perfect pearls and Pearl mists we made ourselves. That is it for now, my friends, Thanks for sticking with me until now. Have a wonderful week and don’t forget to make something awesome!! This week’s lesson with Tamara Laporte was about dealing with the inner critic and dealing with change. The technique was to use symbolism and transformation in our work. Hence we did a paint over collage. I did a similar class last year in Life Book in 2015, but I can tell I’ve learned more about shape shadow and color. I began by looking through my fashion magazines for a three to four inch face without a big smile. I had several girls I wanted to paint, but I chose the 3/4 face because I wanted to practice. I’m taking a portrait class at the Community College and I’m also working on a 3/4 face. After I found the girl, I found a really nice tiger to sit by her. I then collaged other magazine pages that I thought would go well with the theme on awatercolor paper block. Here is the before picture. Tam said not to go overboard with the collage, but I loved all these designs so much I had to include them. The next step was to add clear gesso and start painting the face. It doesn’t look like much, yet! In a few hours, I was able to transform the girl into a jungle girl and her tiger. Tamara added an aura around her, but I decided to add a glow around her face. The flowers around her head are also from a magazine and the butterflies are from a collage page and that peacock was also part of the page I cut out. I added some green branches and a few rub ons. Here are a few close-ups around the main image.The four leaf flowers were part of the collage and I just added more color around the leaves and a rub-on in the middle. I also finished her off by adding white dots all over her hair and a few on her face where I had laid my finger, so I went with more dots. The Imagine word is also a rub-on. And this is the close up of the face with all the white dots. This is another one of my favorite projects of Life Book 2016 and my husband made me feel so good when he exclaimed “That’s beautiful, bet one ever.” What a sweet thing to say. I think he’s a keeper! I though I’d show you my work in progress for my portrait class. As you can see I need to paint the flowers and a wide brim hat. and the tulips at the bottom of the canvas. There’s still lots of details and tweaking to do, so I’ll post the finished product next week. Thank you for stopping by, and keep on creating! This week’s lesson was delightful! Jenny is a new artist to me. Her art is so ethereal. I love her grungy style. There are so many layers in my painting, I think I got heavy-handed again with the gold highlights. I love the see through effect I got in some places. I started out collaging papers – which I found very meditative. Then I used acrylic paint to stamp several layers on the corners with foam stamps. I let those dry, then added more colors in complimentary hues. After those layers dried, I drew the face with a stabilo all black pencil, then I added flowers with molding paste through a stencil. I couldn’t find the stencil I like, so I picked a bigger one because the face I drew only used half of the canvas and I didn’t want to leave a large empty space. I also used a Tim Holtz stencil with white molding paste and waited for it to dry. Then, I smoothed it down using fine sand paper. I also added a single flower on the lower left side. I really love that all the layers can be seen here. I dripped some see throuogh liquid acrylic paint for contrast and to give it a grunch look, but I was afraid I would drip too much on the face; afterwards I thought I should have dripped some paint on the side of her face. In this photo you can see the different media I used including the sketching. I added Quinacridone / Nickel Azo Gold for a reddish gold hue, and sepia acrylic color to the edges to frame it. To make it shine, I used gold acrylic paint on the surface of the dried stenciled molding paste. I just love all the layers that can be seen in the lower right corner. Lastly, I added translucent white acrylic paint on her face and some white highlights on her upper eye lids, bellow her eyebrows, on her nose and a bit on her lips. Since I used a 12×12 flat canvas, I’m going to buy a frame for it because this is one of my favorite paintings so and probably more to come! Thanks for coming by, and please leave me a comment. I want to know what you think. a game for facing your fears…. This week’s lesson was taught by Kristin Dudish. I added a link to her facebook page because we’ve been having issues with the NING site and cannot download the class or any of the links. But that’s all right because Tamara gave us another link to download the lessons and the PDFs. I found this class very interesting and enjoyable. We had to take a picture and divide it in 2 inch squares. I loved doing this because when I was younger I loved to take puzzles like these and see if the final picture looked like the picture in the magazine. I’m obsessed with Frida Kahlo and there are some great black and white pictures of her. I googled her and came up with this one. I cut her up in 2×2 inch squares and using another paper with 2×2 blank squares I proceeded to draw and paint what I saw. Shapes – triangles, squares, circles, lines; no flowers, eyes, chins, etc. – just shapes. The media I used were, watercolor crayons, regular crayola crayons, prima coloring pencils, charcoal, plain pencil, pastels, oil pastels, water-color pastels, a regular ball point pen, watercolor pencils, black india ink, acrylic paints, and dots done with a pen. This is a closeup. You can see some of the media was hard to match up to the different squares, but I thoroughly enjoyed playing this morning. I can see where I need to pay closer attention to the different shapes so they can match up better. I’ll be playing with this technique again, for sure! Thanks for stopping by. Please leave me a note, either way, I love to read comments. 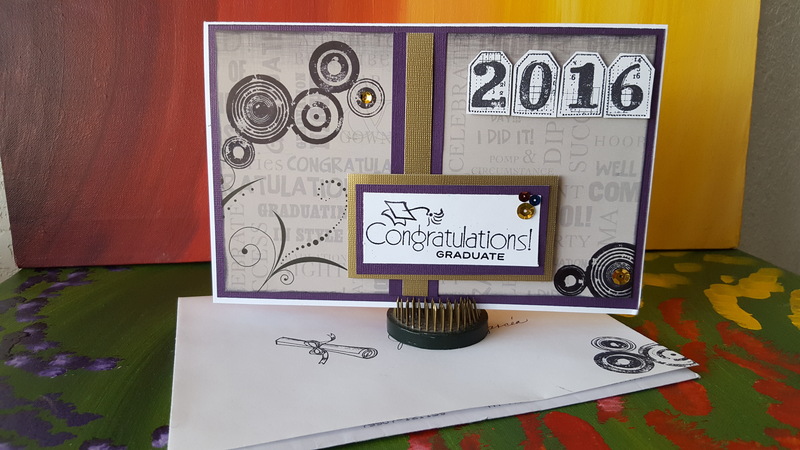 Here are some graduation cards I’ve made in recent days. I helped some friends to make some too, but I forgot to take pictures! His school colors are purple and gold, but he also went to a magnet school with blue so ci added them to the sentiment. The circle stamps are Tim Holtz, and the 2016 are Unity Stamps. I also added some gold sequins. I also a Unity Stamp for the inside quote. This one is for a girl. Her school colors are red and blue. 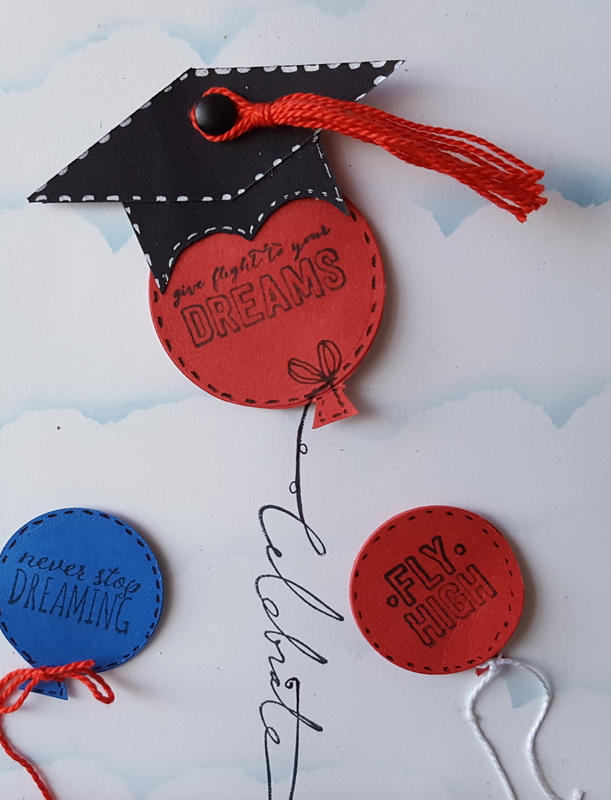 I cut the balloons out with my circle dies added some yarn and the black cap with the a red tassel. 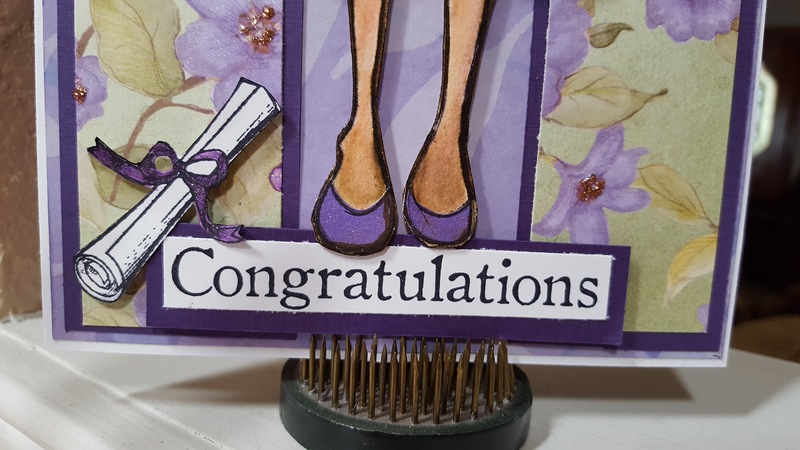 I got my inspiration for this card from a card I saw at My Creative Time blog hop. I used a torn piece of paper in the shape of clouds and using a sponge, I colored them with Broken China distress ink. I then added the embellishments on the base. The Celebrate stamp is an older Stamp’n Up stamp. I also added yarn for the balloons’ strings. I also stamped inside the balloons. On the inside I stamped this new stamp by Unity Stamps. I received the set just in time to make my cards! 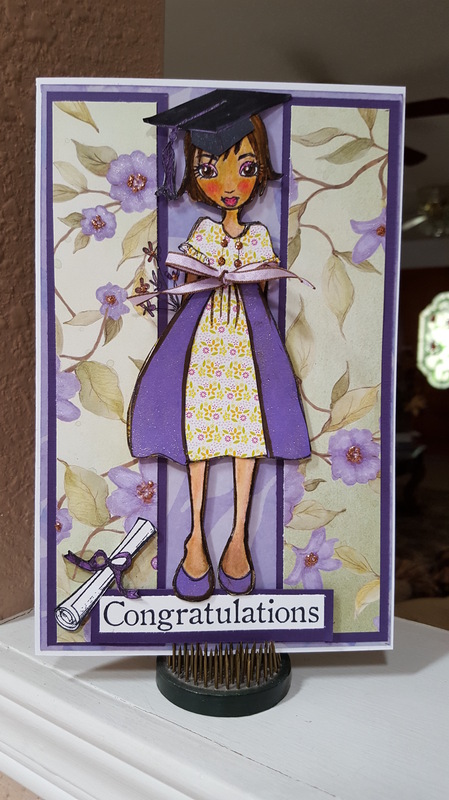 This one is for a young lady who is graduating from college. I used a Julie Nuttig doll stamp and a brand new face stamp to fit these girls from Peachy Keen. It firs perfectly! I used watercolor paper I then colored the face with watercolor pencils, and pieced together her dress and shoes to match the background. Her aunt said she likes purple, so I made purple the accent color. 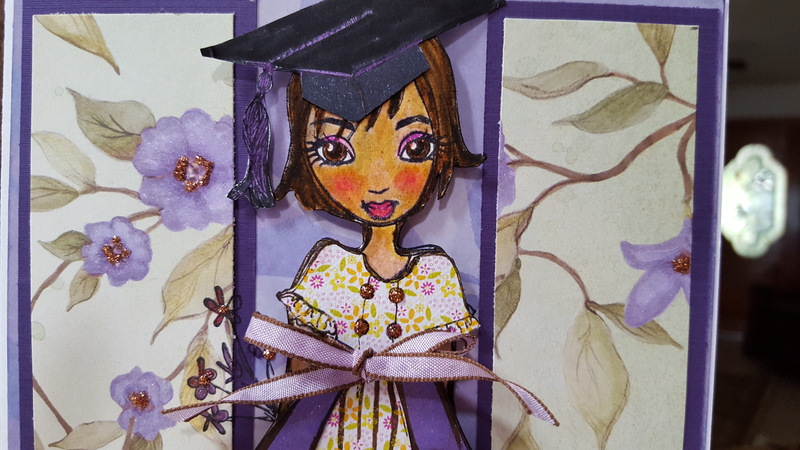 I then added a small ribbon around the waist and a graduation cap. Close up of the graduate. the sentiment along with her diploma. Last, but not least, the card I made for my grandson. It had to be special! 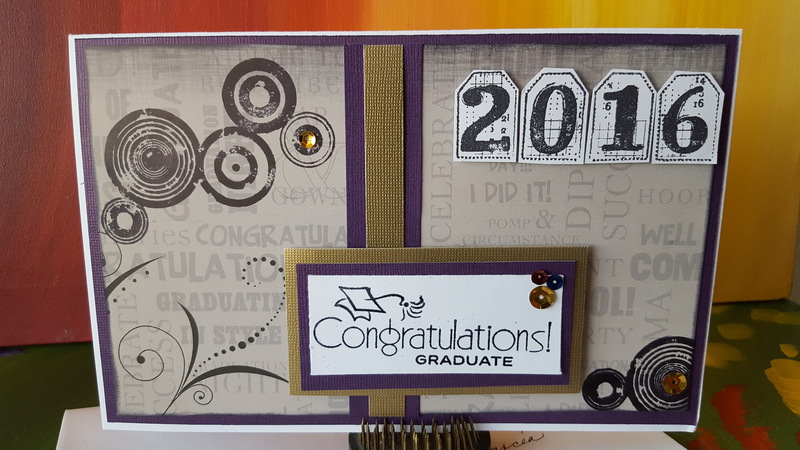 I used black and gold because those were the colors on his Graduation Announcement and the invitations. The stamp on the left is a Unity stamp. 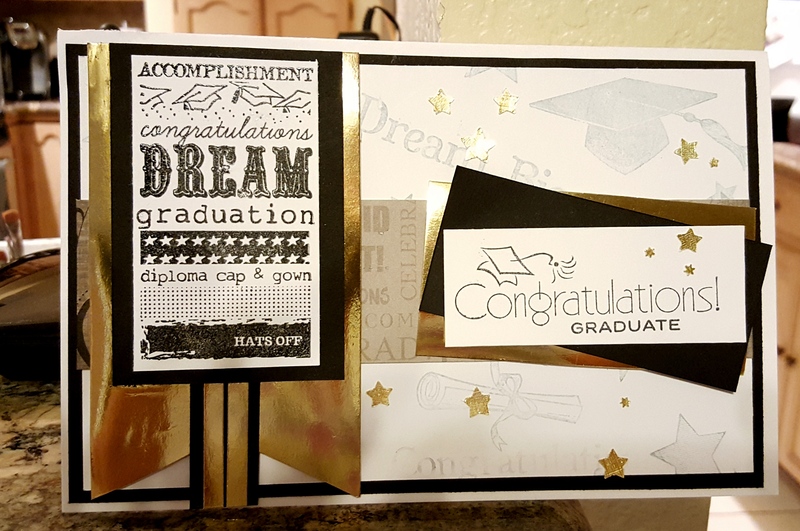 I didn’t have anymore graduation paper so I stamped the diploma, caps, words, and stars on white cardstock with gray ink. 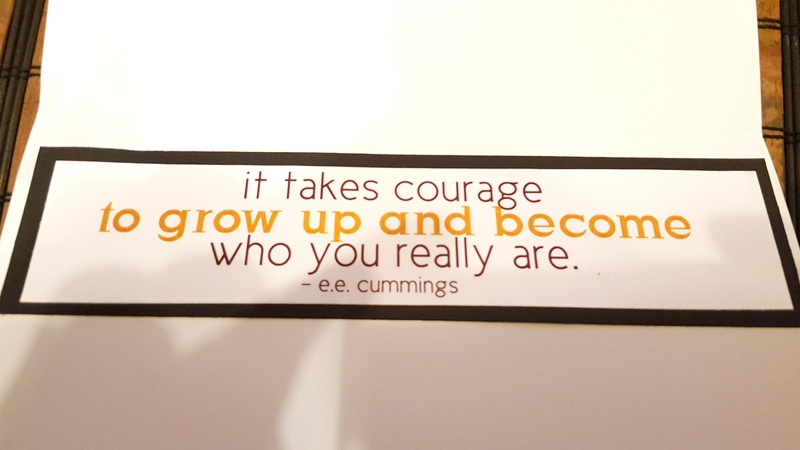 I got this quote from Scapbooks.com and added it to the inside of the card. 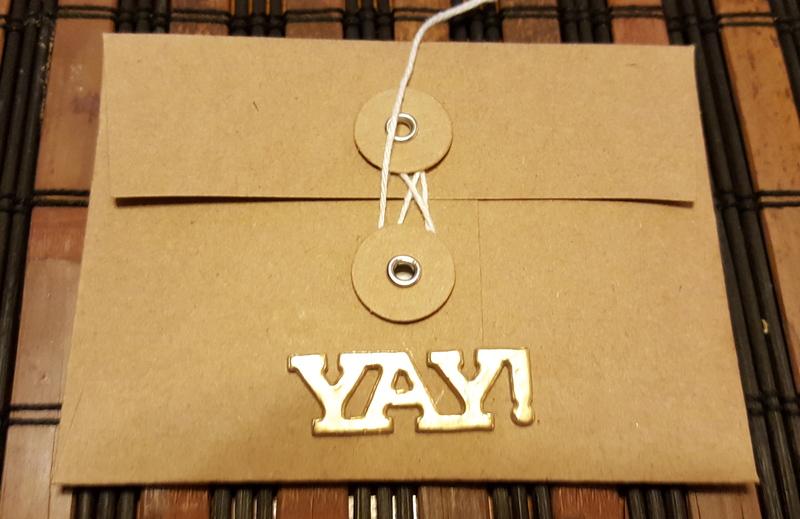 As a gag gift, I enclosed a small envelope with some graduation embellishments I found at JoAnn’s. 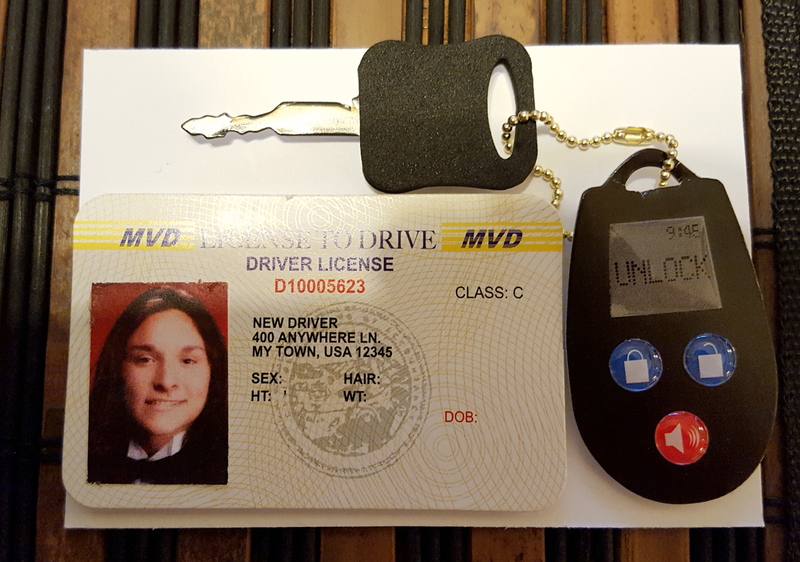 It had a small driver’s license and a set of keys in heavy cardstock. I glued them on a piece of cardstock and glued a miniaturized graduation picture of him. 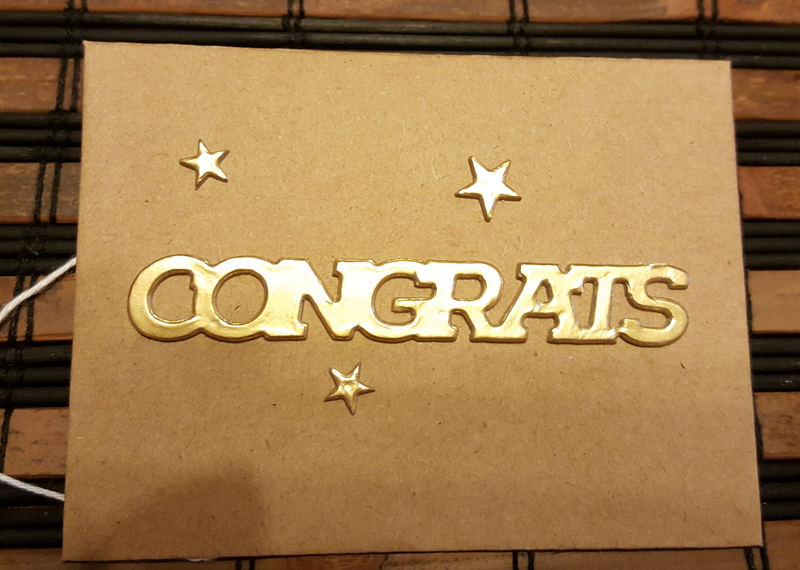 Then I put it inside another small envelope with gold chipboard sentiments and stars. I’m waiting to see how he reacts to it. I also added on the back of the small envelope under the flap: “Patience is a virtue.” Just saying! Looks like I’m caught up with all my graduation cards!! 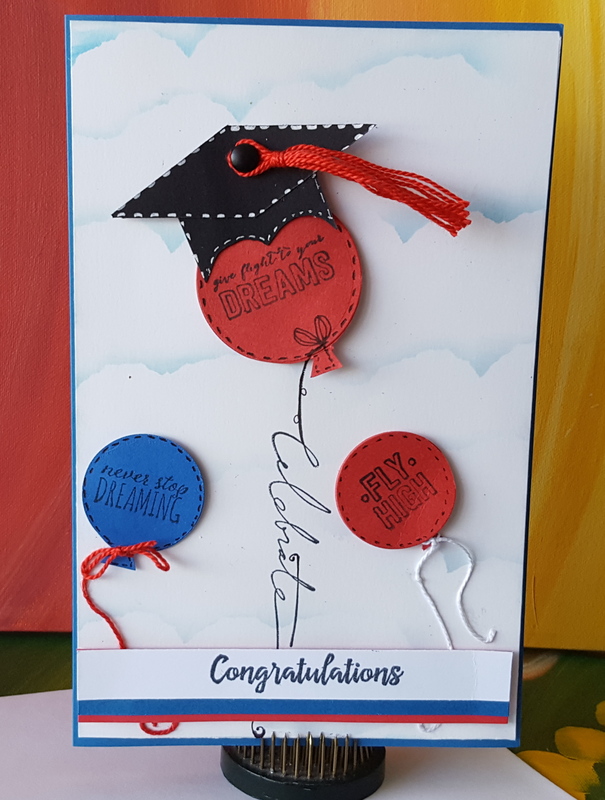 I’m back with Life Book 2016, but hadn’t had a chance to post my lessons because I’ve been busy making graduation cards for the kids in my congregation and especially my grandson’s. I will post those pictures later. Oh my! This lesson really touched my heart because Wyanne has gone through a life changing event. In 2013 she was diagnosed with head and neck Cancer. The doctor gave her a choice of undergoing a 12 hour radical surgery, chemo, and radiation or saying goodbye. She decided on surgery and had her whole tongue removed plus many lymph nodes. She had to take a year off to recuperate and now she has a feeding tube to help her get liquid food. I admire her so much! When I heard her story about her husband fussing over her coughing, she just told him it was normal, but her husband said “Your normal is not the world’s normal” which gave her a jolt, it reminded me about what I went through eight years ago. I also had that experience after I had my mastectomy. Three days after I came home from the hospital, I developed a high fever that knocked me off my feet. My husband, who took very good care of me through the whole nine yards, took me back to the surgical clinic and it was determined that I had an infection at the site of the wound. One of the surgical interns proceeded to squeeze out the pus out of the wound and insert gauze. They also sent a sample of the pus to the lab for culture. This event was worse than my mastectomy! Then he sent me home with antibiotics and gauzes so my husband could clean out the wound twice a day. Thee days after getting home from the pus squeezing, I developed another fever, so back we went to the emergency room this time. Since I was still recuperating, they put me in an isolation room and the doctor returned with the results of the culture and informed us that it was MRSA, a flesh-eating bacteria. They changed my medication and sent me home to return and see my surgeon again in five days. So, I know exactly what Wyanne was talking about. When you realize that you will never be the same person ever again, it jolts you back to reality – a new reality. But, anyway, let’s get back to lesson 19. Since Wyanne has no tongue, she tries her best to talk, but she can’t be understood, so her lesson had captions to help us follow her instructions. I really had to pay attention with this one! Wyanne, taught a new technique; drawing a face, then using tracing paper to copy the drawing, but then attaching the tracing paper to the side of the watercolor paper and adding india ink to it then smooshing it to the watercolor paper. She said this technique was made famous by Andy Warhol. After the india ink dried, we used watercolors and washi tape for the embellishments. This is my project. I’m afraid of spiders, so I drew a tarantula and put her right on my shoulder – it seems harmless enough! The Lotus represents the scar I have from my Mastectomy. After posting this, I realized this girl either has no pupils or her pupils are dilated, LOL. She has a strong character, though! This week Pauline showed us how to draw an expressive portrait using a picture from a portrait one of the masters painted. I then proceeded to very carefully draw the girl using an Inktense pencil in black, indigo, and brown. As much as I tried, I couldn’t get the angle of the face just right, but I did manage to follow along with Pauline and using her direction, this is what I came up with. The background was made by smooching some paint from a pallet paper and giving it a twist. I did several smoochings until I came out with one I could use. I think she has a serene look and I like it a lot! Although some people are entitled to their opinions, one person said it was a bunch of BS. I don’t care, I love how this came out, don’t you? Oh my! This was intimidating and very creative!! I’ve been wanting to try my hand at making girls with different head positions and this is exactly what I had to do in this one. Renata is also a past Life Book student. It’s really amazing how she has grown and developed her art work. Now she is teaching! I’ve seen some of her work in other places and I’ve been wanting to make girls that look like they’re glowing and looking up. Renata was so generous because she was very accommodating. She had two different lessons. In the first video she showed us how to do a face looking up, but if we found it difficult, she also posted a front facing face and different techniques! I thought that was awesome! The lesson was done completely in watercolor, with the exception of using a stencil to transfer the different objects on the page. I tried three different girls. The first one I did without editing myself. I just went through the whole lesson following her instructions. There were different aspects I like about each one. In the first one, I liked how the hands turned out, but not the face as you can see here. I didn’t even finish her because I thought I would give it another try. I do like the background stencil, but her neck was too long. I did not draw a mandala because I’m terrible at it and I don’t feel comfortable doing it, but I took a stencil that was not proportionate and outlined it with a pencil then added the different colors on it. She is not looking up, she’s looking at me, but her hands are great! On this one, I love the softness of the watercolors and that you can see the Lotus I stenciled in, but the hands look out of proportion. This girl is looking up, though. Doesn’t she look like she’s coming out of the water? Ah, this one looks so much better looking straight on, but her hands looks like a cartoon character’s hands, For this one I took my time laying down the watercolors then applying a sticky Martha Stewart stencil and running gesso through it. It was fantastic the way it came out! The lines were crisp and bright. I also used the gesso to simulate the light rays. Because of the purple watercolor I used on the background, I couldn’t get her face to look right, but, hey, it’s not real! There you have it, my crafty friends, three lessons in one post. Thank you for sticking with me until the end. I hope to see your comments, which make me very happy! PS After I finished writing this post, Renata posted on our private FB page that we can make the colors more transparent and make it like she’s shining by spraying some water on the piece and taking a paper towel and lightly lifting some of the color off. I’m going to try that for sure!! This event is a Federally recognized non-profit organization to promote Native American culture. I didn’t know what to expect, but I was thoroughly in awe of all the beautifully intricately beaded garments and accessories. For more information about this event you can go here: Gathering of Nations. There were dancers and singers representing more than 500 tribes in North America and Canada. It is a three-day event, but we only went on Saturday and part of Sunday. Here are some pictures I took of people walking around the stadium. I asked permission to take their picture, of course. This young girl was on her way to the main floor to dance in the young girls competition. Look at the beading work on these moccasins. They were completely hand beaded. Just beautiful! Mexico was represented also. Look at the long feathers!! I had many more pictures, but somehow they are lost in my file system. Well, you get the idea. If you want to see more pictures. you can always go the link above. Last week I entered two challenges at Unity Stamps. Using teal and green combination, I made this card for baby. 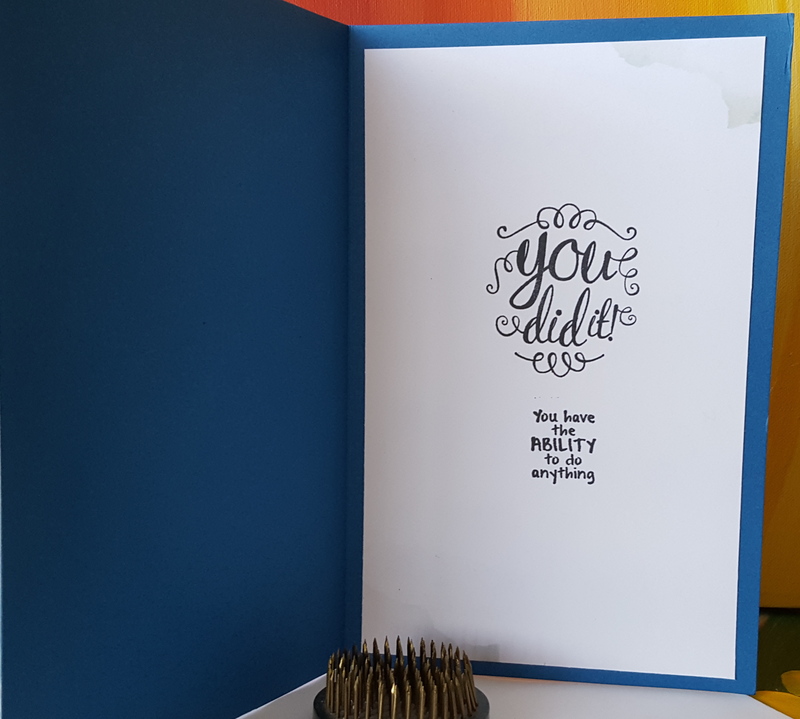 Earlier in the day I made a card for my sister who was going to a baby shower but I didn’t take a picture of it. So I made this one using a Sizzix die I found on sale at Hobby Lobby, by Stephanie Barnard, Triple Circle Flip-its. I couldn’t find teal cardtock so I took white cardstock and my acrylic paints and made some! Easy peasy! When you open it, it reveals another sentiment. These cards are hard to photograph, but I did the best I could. I used the Hello Little One kit. I first stamped the animals on gray cardstock using black ink, I cut them out and added the small hearts in red. I added the black, gray, and white cord for added texture. The second card is very similar, but instead of using the die, I just made an old fashion 4 1/4 x 5 1/2 card using coordinating papers from a 6×6 stack. I just happened to have some googly eyes in my stash small enough for these elephants. Aren’t they cute!! I also added three hearts in three different sizes. Here’s a close up of the elephants. This time, I didn’t have to spend time making a card, because I created a card for my cousin’s daughter when she got married in Phoenix two weeks ago. Wow! I want to win 100 stamps!! So this quick card was created in less than five minutes! I used a feather from the Beautiful is Never Perfect kit by Angie Blom. I so love the detail!! 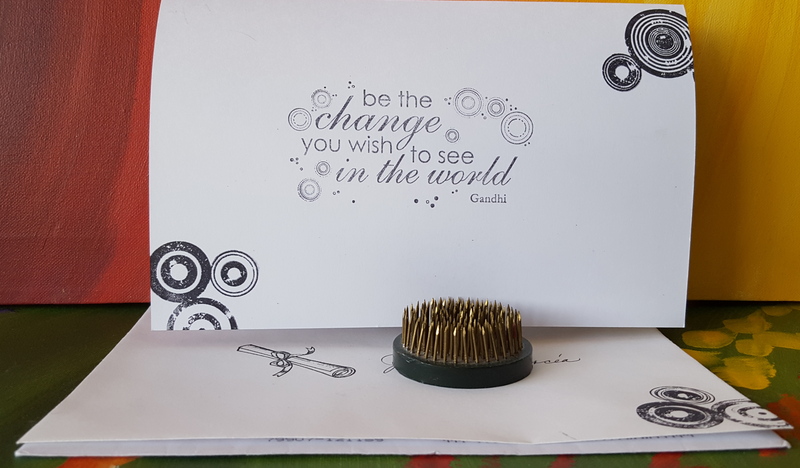 I also used one of the sentiments that comes with it inside double stamping it for a shadow effect. So much fun playing in my craft room! I just finished reorganizing my craft room and I found so many things I don’t use any more. I will be posting what I have for sale here and my FB page. There will be stamps, stamps, and more stamps, as well as a “never used – new” Making Memories Slice machine with design cards and accessories, Cricut cartridges, embossing folders, a gypsy, two Jukeboxes that hold six Cricut cartridges each for designing or combaning your own images, and lots more! Until next time, you have yourselves a great week and keep on creating!! Welcome back my crafty friends! I’m posting a little late because I was focused on something else last week and didn’t have time to finish my lesson, but here it is! Roxanne’s specialty is journaling, but I did her lesson on a regular 11 x 14 watercolor page to include in my Life book folder. I started out by collaging different ephemera (magazine cut-outs) one with a focal point that I could paint over with acrylic colors to match, then added other complimentary colors. After that was done, I jotted down events that made a big impact in my life and I illustrated them on the focal point ephemera. He had the tumor removed and underwent chemotherapy and radiation treatment – and yes, he survived. The funny thing about all this is that my dad had a great attitude, or maybe memory lapses, through the whole process and would ask what were the treatments for every single time. I would remind him that he had Cancer, and he would say, “No, I don’t have Cancer!” Perhaps that’s what helped him get through it. And I’m thankful for that! He lived two more years after this, but died of pneumonia, not Cancer five months short of his 100th birthday. Then my husband’s PSA was checked on one of his routine appointments and the numbers were higher than normal. He had another one done a month afterward and that’s when he was diagnosed with Prostate Cancer. The Urologist gave him a choice to just wait and see or have treatments. After many weeks of research, he decided that the best thing for him would be to have a prostatectomy. “Get it out!” He said. He had a wonderful young surgeon who believed in saving as much as he could of the nerves in the area, and left markers where the prostate was so the affected area could be found by an X-ray in case his counts went up again. A year later, his numbers did go up again, but thanks to the markers the surgeon left in his body, he went through radiation treatments and killed what cells were left! While my husband was going through his surgery, I started having some unusual pain in my right breast. I didn’t pay much attention to it because I was taking care of both my dad and my husband and I didn’t have time for me, until the pain got so sever I couldn’t touch my breast. A few weeks later, my breast developed an “orange peel” skin. That’s when I decided I better go see my doctor. The next week, I went back to the doctor and he said the ultrasound was normal, but I was adamant that something was wrong. He insisted that everything was OK, but I was convinced otherwise. So, he sent me to a surgeon who took one look at my breast and set me up for a biopsy. My mother had Breast Cancer and I felt the tumor before she went in for surgery, so I though I knew what to look for, but this was different. Hers was a solid hard mass. What I felt was pain around the areola and the breast was very tender. Sadly, my mother succumbed to the disease after fighting it for eight years. I didn’t want the same thing to happen to me. So a word of advice to you, my friends; if something does not feel normal, please check it out and insist on getting a second opinion. It could save your life. To make a long story short, I was diagnosed with Invasive Ductal Carcinoma. Left untreated it could lead to the Cancer breaking through the wall of the duct to other parts of the body. The Oncologist said the tumor was 8 cm. and gave me a rating of Stage IIIA. I had a good chance of survival because it was confined to the breast area and a few lymph nodes. After undergoing chemotherapy, a mastectomy, and radiation. I am still here and in remission now for nine years this coming May. See, I told you Cancer has made a big impact in, not only my life, but the life of my loved ones as well. Thanks for sticking with me this far! So now on to my project. In this picture you can see the important events in my life in addition to the Cancer story. I married my husband in 1972, I had my daughter in 1975; the moving van indicates the 13 moves we’ve made, and the best vacation ever – Cancún, Mexico, and of course, my art is in the middle of everything! I did add other events that had a big impact in my life, but the focal point is Cancer and Hope! Another sad event in my life, was the divorce from my first husband. It wasn’t all sad, because I had my first child, a son, in 1970. You will notice that in addition to the doodling, I also added stamping. I stamped, “The best things aren’t things” in this section. I also added metallic molding paste in two different colors through one of Heidi Swapp’s new art screen, Dream. Our favorite vacation destination, Lake Tahoe. I spent a lot of time adding doodles which help me relax while sitting with my dear hubby watching TV. I added this last image of a girl in a canoe, because I’m afraid of water and I’m hoping one day to get in the water and swim – that’s a Big Dream for me! Thanks for coming by, and hope you return to visit again!! Where imagination comes to life!